The oceanfront view from the newly renovated penthouse. Walk out your back door and straight onto the beach. Watch the sunset over the water from your living room. The sectional makes sure everyone has a place to sit. You'll be able to cook a restaurant style dinner in this kitchen. This home makes for the perfect getaway and can house up to 6. This queen bed with welcome you after a long day at the beach. Get a great night's sleep on this comfy queen size bed. There is room for more with this queen size bed. 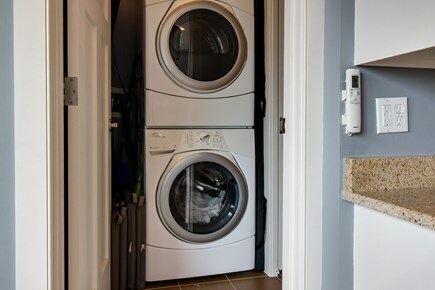 Washer/Dryer are here for your convenience. Get ready for the day in this bathroom. 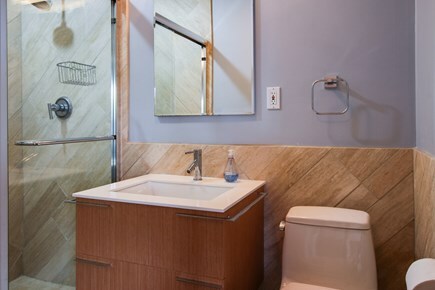 This second bathroom will make sure everyone can get ready. Come up onto the 400-square-foot deck and relax in the hot tub. 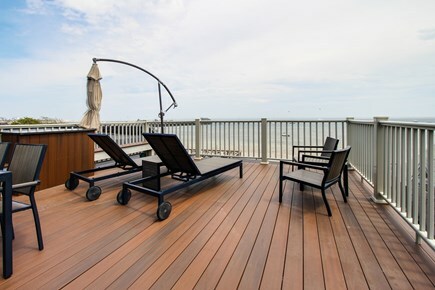 Look out over the ocean on this beautiful roof top deck. 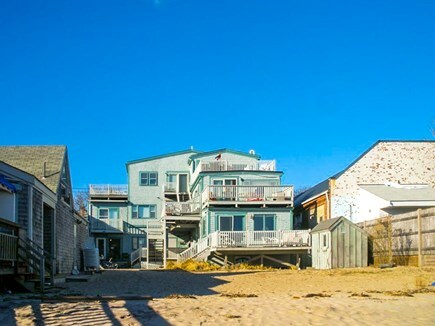 The beach is right outside your door at this gorgeous waterfront Cape Cod home. You get modern comforts and a spacious deck amid a beautiful setting. 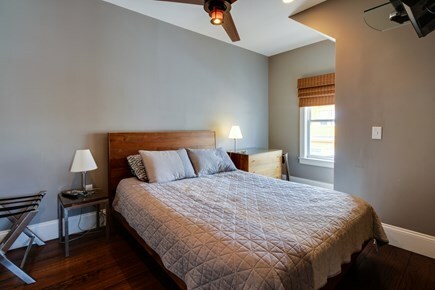 This home has been newly renovated and is in the heart of Commercial Street, near all the area attractions Provincetown is known for. The Pilgrim Monument is just a half mile away! You have to walk up three flights of stairs to get to this gorgeous penthouse. Hardwood floors abound, and a blue rug envelopes the floor in the living room. Relax on the gray armchair or sectional couch and watch your favorite show or DVD on the flatscreen TV. 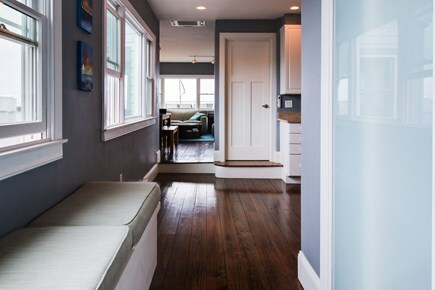 Glass doors lead to a large deck with a great view of the beach and street. You can lounge on one of the chairs, too. The airy kitchen boasts a four-seat high-top table as well as a six-seat dining table with benches. There are also a fridge, electric range, and a dishwasher. Each of the three bedrooms have their own TV. 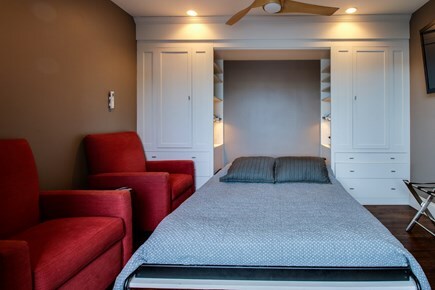 One has a queen bed and red armchairs, and the others have a queen bed apiece (one of the beds is a Murphy bed). There are window seats for day reading and two modern bathrooms with beautiful showers. 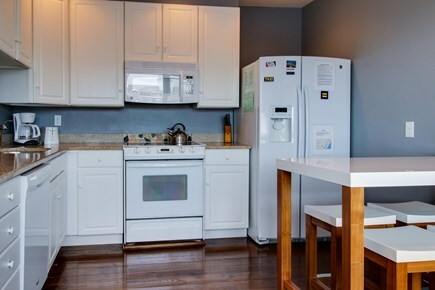 You get free WiFi, central air conditioning, and a washer and dryer. There's even a parking spot two blocks away for your car should you need it. Provincetown has a welcoming LGBT vibe and is a great spot to soak up the sun, whale watch, or go fishing. You can shop and go to area bars, too. 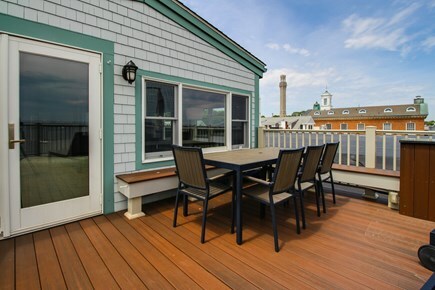 Enjoy the myriad pleasures of Provincetown at this lovely penthouse home. Additional pricing info: For real-time pricing information, including the cleaning & booking fees, please contact Vacasa. State and local taxes of 14.45% will apply. This is a spectacular spot for a winter vacation. 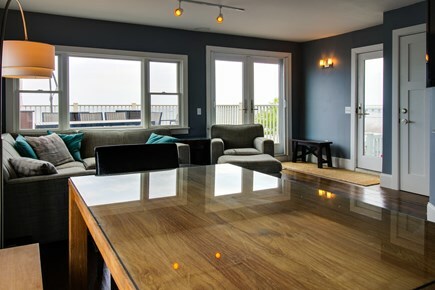 Our party of 6 delighted in the excellent accommodations, with a stellar third-floor view directly overlooking Provincetown harbor and Long Point. Located in the commercial district in the West End of town, we were close to restaurants, shops, and the grocery store. What a find! This may be the best lodging in Provincetown. We lived this condo: the view, beds, furnishings, everything. 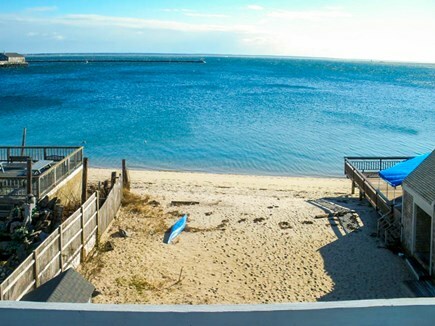 A perfect place for 2 couples to enjoy Ptown and Cape Cod! This rental is right in the heart of Ptown. We highly recommend this unit, with a good layout, great location and perfect views. Loved it. Definitely booking again. Couldn't be better placed on Commercial Street. On the beach and in the middle of the action. Comfortable and Clean. Perfect getaway. Well maintained, fantastic deck & great location. Would stay here again. This is a must stay location in Provincetown! It's in the center of it all - all shops, restaurants, entertainment within a few blocks! Convenient. 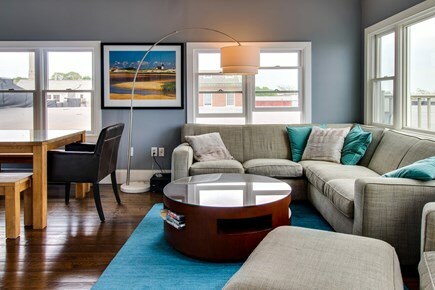 The home is modern, comfortable and one of the best views in Ptown! You can see it all from the comfort of indoor window seats or just enjoy a beautiful sunrise from the awesome deck! Each bedroom has it's own TV. All beds are very comfortable. We will be booking this spot again and again and again! We had an excellent time with our (adult) children in this place. I wouldn't hesitate to recommend it.